Sleeping is vital for our overall health and wellbeing. Generally speaking, on average, an individual spends 25 years sleeping in his/her lifetime. Sleep enables our body and mind to rest, regenerate, and prepare for the new day. The recommended daily hours of sleep are 7 to 9; however, besides getting enough sleep, there is another aspect of sleeping that also plays a crucial role, that is, the sleeping positions we choose. In order to reduce pain in the shoulders, you should sleep on the painless side with the legs slightly bend. You can also hug a pillow near your chest and place another one between the knees. You should lie on the back and put a pillow under the knees and a rolled-up towel under the curve of the back. According to experts, some headaches are usually a result of a twisted neck during sleep. 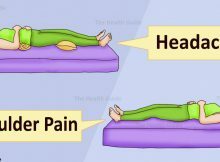 If this is also the cause for your headache, you should surround your head with pillows to prevent it from turning. If your sinuses are inflamed, you should sleep with the head elevated in order to prevent mucus from pooling in the sinuses. According to a report by the Ehime University School of Medicine, sleeping with the face down can significantly reduce the blood pressure. Place a pillow under the knees to prevent the spine from arching. If you provide additional support to the neck, the pain will significantly reduce. So, roll a small towel and place it under the neck or under your pillowcase. To improve your digestion, you should sleep on the left side because the stomach is located on the left side and when you sleep like this, you enable gravity to better the process of digestion. If you suffer from heartburn, sleeping on the left side can be of great aid. Always consult your physician regarding your health problem and your sleeping position before making changes.